Grand Rapids is Michigan's second largest city with a population of about 196,000 (Image: Wikimedia Commons). Once upon a time I wrote about the city of Grand Rapids, Michigan, for SHEI Magazine, a student-run publication at the University of Michigan. And while that article was lovely and informative, it was penned before I could call myself a resident of the city. Now, a year and a half later, I've been living in G.R. for a few months, and I've learned a few more things about Michigan's second largest city that I'd deem worth sharing. In a city with a population nearing 200,000, there's always something going on around here — and that's just the way I like it. I moved in with a friend on the northeast side of the city toward the end of May, and since then, I've been slowly but surely exploring the different nooks and crannies, checking out the bar scene, finding new places to stuff my face, and generally enjoying "big city" living (it's only the 121st largest city in the country, according to this cute little list on Wikipedia). 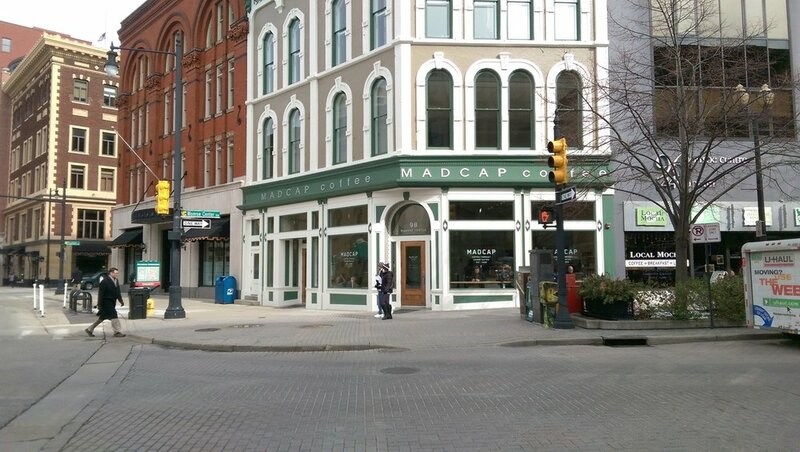 MadCap Coffee, a mainstay in the heart of downtown G.R. We'll start with the most important meal of the day: coffee. Yes, the black nectar of the gods. We could head for the neatest little Starbucks you ever did see that's housed in a tiny brick building on Wealthy Street (technically in East Grand Rapids), but those places are everywhere, so let's go somewhere more unique. How about the Matchbox Diner in Eastown? They describe themselves as an old-school diner, but stepping foot in here feels like entering a fancy yet cozy little restaurant. They've got your ham and cheese omelettes, your hangover burrito, and, for my fellow millennials out there, your avocado toast. If you're looking for a real old-fashioned experience, though, maybe we should consider Van's Pastry Shoppe on Fulton Street. Van's has prices that'll take you back in time. A small coffee? That'll set you back less than a dollar. A dozen donuts? Don't expect to pay more than $6. The first time I went in here — probably sometime in January 2016 — my hair was almost blown back by the relative inexpensiveness of everything. I guess when you've been open for more than 85 years, you build up a local customer base that allows you to keep prices at a minimum. And then, of course, there is always the perpetually open Grand Coney Diner on Michigan Street where you can snag "the really big deal" — eggs, sausage, bacon, ham, hash browns, toast, and two pancakes — for just $8 (as of this particular writing) and the super modern MadCap Coffee Company on the corner of Ottawa Avenue N.W. and Monroe Center Street N.W. downtown. The Downtown Market and Slows Bar-B-Q are among the places to grab a bite in downtown Grand Rapids that I mentioned in my SHEI Magazine piece, and while they are still wonderful establishments to stop by, I have other eateries to tout now as well. If we're looking to get our Italian on — and by that, I mean grab pizza — two places I'd suggest are Peppino's Pizzeria & Sports Grille and Lucky Luciano's Pizza, both on Ionia Avenue. The former, a large, Buffalo Wild Wings-type establishment, has a number of craft beers on tap, while the latter, typically a late-night stop after a night out on the town (if we're being completely honest), offers a host of gourmet pizzas, such as the mac-n-cheese with bacon and the meatball-topped pizza. For a miniature kind of menu — as in small plates — we could head next door from Luciano's to J. Gardella's Tavern where the sliders, with your choice of pork, chicken, beef, or fish, will run you just $3 a pop and where $2 well cocktails reign every day of the week. The laid-back atmosphere and always fantastic music (think late '90s alternative) make for a great spot to grab a quick bite during the day. Let's stop thinking about food for a hot second here and take in some culture. The Frederik Meijer Gardens & Sculpture Park and Urban Institute for Contemporary Arts come in handy in that regard. The indoor conservatories of the gardens include such selections as the Earl and Donnalee Holton Arid Garden, where you can find cacti of all shapes and sizes; the Victorian Garden Parlor, which is exactly what it sounds like; and the Lena Meijer Tropical Observatory, which stays balmy throughout the harshest Michigan winter. As for the UICA, compelling exhibitions, events, community programs, and youth development shenanigans abound. "UICA initiates conversation in response to visual art, music, film, literature, dance, and performance art featuring regional, national, and international artists," so says their website. After taking in some of the exhibits there, perhaps you could end the afternoon with a stop in Rosa Parks Circle, in the heart of downtown, where you're likely to find something afoot. Free musical events often take place in the public space and it hosts an ice skating rink in the winter. And I'd be remiss if I didn't recommend stopping at the Gerald R. Ford Museum on Pearl Street. Now is when we make way for the B.O.B., with its five floors of fun. With B.O.B. 's Brewery, Judson's Steakhouse, Bobarino's, and more, there are plenty of opportunities to grab some grub and get your evening started with a stiff (or not so stiff) one. At $6 an hour, the pool tables at Bobarino's on the second floor always seem to be popular. Another good option for dinner (and here comes the Italian again) is Palio Grand Rapids on Michigan Street. I had their Chicken Fettuccine Alfredo a couple months back and I can tell you it's something I'd certainly go out for again. But of course, you could always go out in style and stop at one of the bars or restaurants housed in the Amway Grand Plaza. The Kitchen by Wolfgang Puck, Rendezvous, and Cygnus27, atop the hotel, offer sophisticated options, while GP Sports, the sports bar sporting 40 television screens, allows you to kick back while still enjoying the elegance that is the Amway. Save for grabbing a bite to eat here, you may just want to walk around the lobby and peek into one of the ballrooms (there are four). Speaking of fancy-schmancy hotels, the J.W. Marriott and its signature restaurant Six.One.Six are just a little more than a stone's throw away from the Amway and you'd do well to at least pass through. Or, perhaps, you could start to segue into the night with a stop at Mojo's Dueling Piano Bar & Restaurant, which is typically as entertaining as the name would suggest. Just try to get there before they start charging cover at 9 p.m.
Now is when the night truly begins and we're looking to get rowdy — at least a little bit anyway. Honestly, given that it's a Friday or Saturday night, you could just climb the stairs at Mojo's and hit the dance floor right there. If you're looking for a change of scenery, hope that the lines outside Tavern On The Square and the Grand Woods Lounge aren't snaking around the block just yet. Full disclosure: I've been to the Tavern but once, and it is usually quite crowded on the weekends with a smaller-than-optimal dance floor — but I'd certainly want you to check it out for yourself, as it is one of the more popular spots to grab a drink in downtown G.R. I have yet to make an appearance at the Woods, but it consistently has the longest line outside on Fridays and Saturdays, so they must be doing something right. If you're looking for something a little different, Rumors Night Club on Division Street, the "gay bar," if you will, has you covered. The dance floor features a strobe light and sporadic bursts of fog, often timed to perfection to coincide with the bass drop. Their Thirsty Thursdays, which feature half-off drinks, are wildly popular. Taking a stroll on the Blue Bridge back toward downtown is not a bad way to end the night. In fact, I'd recommend it. P.S. In reading over this again, I realize I failed to mention Founders Brewery — their Rubaeus (5.7%) is heavenly.